Orlando, FL — Systems Technology Inc., a research, engineering consulting and product development firm, will demonstrate the newest version of its VR-based parachute training simulator PARASIM (www.parasim.com) leveraging high fidelity virtual environments generated by TerraTools from TerraSim rendered by VBS3 from Bohemia Interactive Simulations at SOFIC 2017. The integration of VBS3 with PARASIM brings together two solutions that have become the standard-bearers for training and simulation in the defense sector. The addition of TerraTools to the PARASIM solution enables support for large area, real-world training and mission rehearsal. PARASIM is a virtual reality parachute training simulator, that provides a safe and cost-effective way for paratroopers to hone skills and plan missions before taking to the air. Around 400 PARASIM simulators have been sold worldwide and the system is used by the U.S. Army, Navy, Air Force and Marines for both premeditated airborne operations and for emergency bailout and ejection training. PARASIM enables jumpers to conduct procedural and safety training. It also allows jumpers to learn procedures for multiple chute malfunctions. VBS3 is the flagship development platform from Bohemia Interactive Simulations, a global developer of simulation and training software. 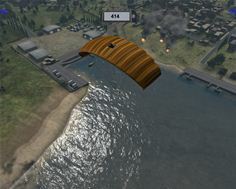 VBS3 simulates all aspects of the modern battlespace to enable trainees practice tactics, techniques, and procedures and develop communication and decision-making skills. BISim products are used by government and industry in more than 50 countries around the world to train hundreds of thousands of personnel every year. TerraTools, the flagship virtual terrain generation software from TerraSim, automatically processes geospatial data and model content to rapidly develop high-fidelity, geo-specific terrains for simulated, tactical military training and experimentation. See demonstrations of PARASIM at System Technology Inc.’s booth #1550 during SOFIC 2017 in Tampa at the Tampa Convention Center from May 15 -18. Systems Technology Inc. (STI) is a research, engineering consulting and product development firm that resides at a unique intersection. Our expertise is where two types of complex dynamic systems meet: machines that move and the humans that control them, from aircraft to automobiles, airships to underwater towed bodies, and oil rigs to astronomical telescopes. Learn more at systemstech.com. TerraSim, a Bohemia Interactive Simulations company, specializes in the development of advanced software solutions to automate virtual terrain generation and geospatial source data preparation. TerraSim products are designed to be flexible, scalable, and compatible by continuing to support the widest range of visual, constructive, and serious game runtimes in the military simulation and training industry. Learn more at terrasim.com.